(AINA) -- The quotes we believe in, say a lot about who we are. His favorite quote is: "A musician must have the heart of a gypsy and the discipline of a soldier." His name is Elden and he's a soldier at heart. He is a young man who lives in the epicenter of the Assyrian homeland. He can hear the steady heartbeat of Assyria pounding in the ancient tombs of his ancestors. He can feel the pulse of his nation pumping life into his veins. He knows the history of the Assyrians who have walked the land he treads on. His cradle rocked where civilization was once born. A common ancestry links him to me, but our realities are a world apart. "I finished my high school in Assyrian language. The dream is still going on here," explains Elden. "Our mother tongue, our language is preserved. There are schools that teach in Assyrian language. All subjects are translated to Assyrian. Can you believe that?" I envy Elden's excitement for having graduated from an Assyrian school though I realize the hefty price tag attached to that privilege. "I believe in unity. I hate discrimination. I am Assyrian," says Elden in no uncertain terms. The Internet is his connection to the outside world. From his home in Iraq, he sends me an urgent message: "Our fellow brothers in Mosul are in danger… Someone has to do something or they are eliminated." How do I respond to Elden's plea? Can I promise him that my nation is doing everything in its power to safeguard its own people? Can I give Elden my word that help is on its way? Can I tell him that we have a National Plan? Can I assure him that the wellbeing of our nation in atra, our homeland, is the priority of every Assyrian around the globe and that every Assyrian community and church has set aside its internal conflicts to devise a mutual plan that will ensure his future and the future of all the children of Assyria? How do I respond to the appeals of a young man who has a limited future in the only country he will know as home? Elden writes to me: "You are free but you should come and see what's going on here…Any how thanks..."
"You're not here. You just don't know!" He reiterates. He is right. I don't know. I write back to him meaningless words of encouragement, "We haven't abandoned you. Our thought and prayers are with you…"
Elden stops writing for a while. I read his frustration when he stops communicating. He finally breaks his silence: "Our votes will be stolen. Our people will be intimidated to not vote Assyrian. Thank you and I wish you a good day." "Elden, our greatest challenge will be to find optimism in a time when the world is spinning out of control in confusion and chaos," I reply. "Please don't give up hope"
A student from Iraq writes to me: "It's very bad…The U.S. did this to us. Now the Arabs and Kurds won't leave us alone." It's Sunday, October 12, 2008. It's a somber morning in the village of Nahla, in Northern Iraq. A slow procession makes its way down an unpaved road. Young Assyrian children carrying flowers walk ahead of a coffin weighing upon the shoulders of pallbearers who have carried Assyrian coffins more times than they should ever have to in a life span. The remains of fifteen-year-old Ivan Enwia Younadam are laid to rest in the gaping mouth of the earth that swallows him whole. An Assyrian flag covers the mound of dirt and rocks that mark his grave. Just eight days earlier, Ivan was standing in front of his home in Mosul, a stone's throw from the Alzhara mosque. Three gunmen approached him and in a flash, his life was snatched from him so violently…so senselessly only because he was an Assyrian. He was shot at point blank range and killed instantly. What went through Ivan's mind in that split second as he gazed down a barrel of a gun? Despite the constant threats of "leave of die" posted at Assyrians doors testing their will and endurance, Elden declares, "I am not afraid of anything." "You have the soul of an old Assyrian warrior," I tell him. "Thank you," he replies and remains quiet a beat or two. I can sense a rare smile crossing his otherwise solemn young face. "I really want to help from all my heart. But a single person cannot do anything here." I would like to write to Elden and say: We've been planning demonstrations around the globe and we're coming out in droves to support you. We are making a difference! We are trying our very best! But that wouldn't be entirely true. Though many decent and hard working Assyrians continue to organize rallies globally, they must contend with opposition from their own kind who still ridiculously argue which flag to waive at an Assyrian rally! One flag. One nation. Perhaps that idea is too simplistic. So while we squabble, Assyrian lands and property are confiscated leaving our nation displaced and in exile. "Innocent souls are more important than land…Nobody can ignore our identity, says Elden. "Our written history is not going to change. Our mother tongue, our language is preserved." The latest surge of attacks arrived on the heels of a single event that put into motion the murder of thirty-two Assyrians in Mosul while 15,000 fled to the Nineveh Plain. On September 24, 2008, the Iraqi Parliament's removal of Article 50, a key clause that would have reserved seats on Provincial Councils for Christians, triumphantly resulted in Mosul being cleansed of its Assyrian population. Assyrian lives are gutted. A nation is uprooted and stripped of its liberties and human rights. Once again Assyrians embark on an exodus to destinations unknown. This is a violent time for the children of Assyria who are living life on the run. For nearly 2,000 days, the Assyrians in Iraq have been under unprovoked attacks. 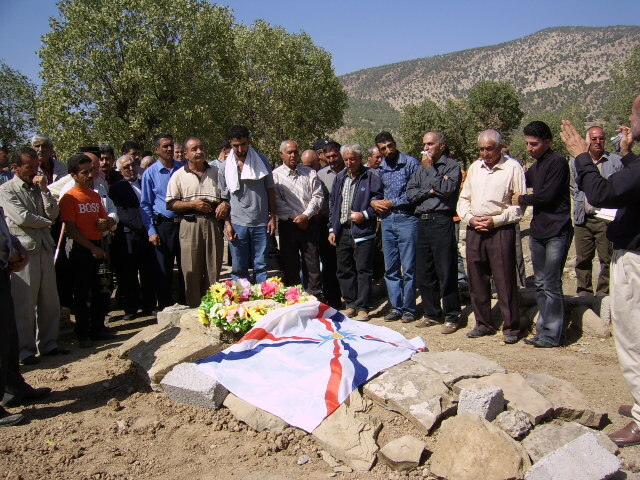 It's not about which particular group is targeting and killing the Assyrians. It's about an ethnic cleansing to rid Iraq of Assyrians. Much like the Ottoman Turks did during World War One. I wonder if all hope and talk of establishing an autonomous region with legislative and executive authorities where Assyrian would be the official language is nothing more than nonsensical and fanciful wishing while our nation on ground zero takes flight. Or will someone in the not so distant future remark, "The children of Assyria did not die in vain. This is how it all began. These were the sacrifices our nation made to resurrect Assyria." Though we are thousands of miles apart, the stars that blanket Elden's night sky are the same as mine. I bid him goodnight and light a candle for all the Children of Assyria. Stay safe my young Assyrian warrior. Rosie Malek-Yonan is an Assyrian actor, director and author of The Crimson Field. She is an outspoken advocate of issues concerning Assyrians, in particular bringing attention to the Assyrian Genocide and the plight of today's Assyrians in Iraq since the U.S. lead invasion of Iraq in 2003. On June 30, 2006, she was invited to testify on Capitol Hill regarding the genocide and persecution of Assyrians in Iraq. She is on the Board of Advisors at Seyfo Center in Europe that exclusively deals with the Assyrian Genocide and is an Ambassador for the Swedish based Assyrians Without Borders. She has worked with many of Hollywood's leading actors and directors. She played the role of Nuru Il-Ebrahimi, opposite Reese Whitherspoon in New Line Cinema's "Rendition." To schedule an interview with Rosie Malek-Yonan, please send your request to contact@thecrimsonfield.com.